MAY 25--While we're on the subject of drunken, vomiting sorority girls, here's a letter detailing the debauchery at a recent formal held at a Cincinnati museum commemorating the Underground Railroad, the hidden network once used by escaped slaves. Miller, the museum's private event coordinator, wrote that she even had to stop one young man as he was preparing to relieve himself on the side of a 'priceless and sanctified' slave pen. 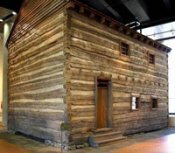 The pen, pictured at left, was moved from a Kentucky farm and reassembled in the museum's second-floor atrium (slaves were imprisoned in the two-story log house prior to their auction).